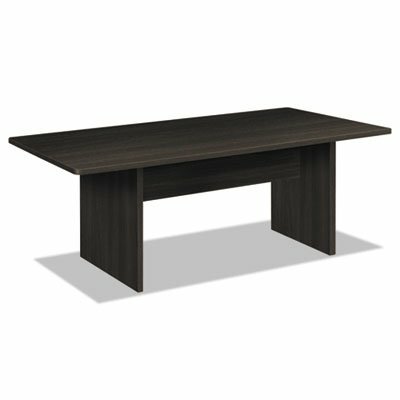 Both practical and stylish, this all-in-one table is professional enough for meetings, durable enough for luncheons. Abrasion- and stain-resistant laminate wipes clean for easy care. Adjustable leveling glides help compensate for uneven floors. Top and base are packaged together for convenient installation. Top Color: Espresso; Base Color: Espresso; Top Shape: Rectangular; Top Thickness: 1". Adjustable leveling glides help compensate for uneven floors. Top and base are packaged together for convenient installation.